There are many ways to make hand printed fabric, so when people ask me what I do I wish I could just transport them to my studio and show rather than explain. What I would show first are my sketches, which right now fall into three general categories: animals, plants, and geometric shapes. Next would be the material I use to make the printing blocks. This is a flat sheet of material like a rubber eraser. It is soft and easy to carve and cut into any shape I want. Once I have transferred my designs onto the block, I carve away the parts that I don’t want to print. When that is done the real fun begins. I often start by printing with black ink to see how the block looks, but after that I can experiment with colors. 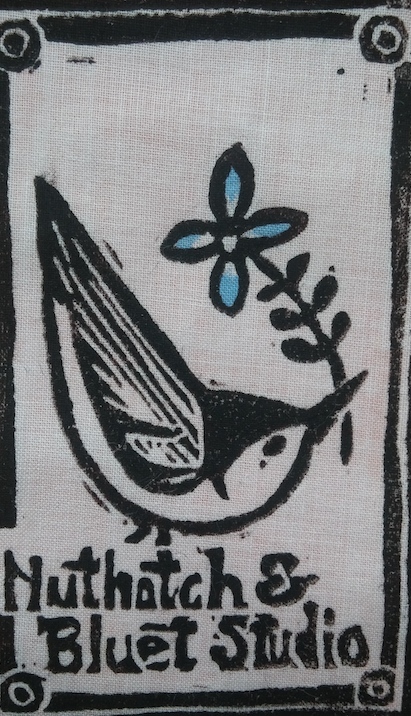 These days, what I create is divided into black prints on very vibrant colored napkins and tea towels or colored prints on linen fabric that I then sew into clothing and bags.